Police discovered wads of cash, military garb, computers, cash and passports from Wilson's Financial District apartment. CHELSEA — The NYPD has arrested a fraudster who leased a sleek BMW in the Boston area by posing as a wounded war hero before driving the lavish ride back to Manhattan, police said. Jeremy Wilson, 42, was charged with grand larceny, criminal impersonation, possession of a forged instrument and criminal possession of a forged instrument for his scheme to get the keys to a 2016 BMW X3, which goes for about $55,000, the NYPD said. Wilson also admitted to raking in over $40,000 through forging more than 200 checks, according to a criminal complaint. Wilson — using the name Jeremiah Asimov-Beckingham and forged tax documents — leased the blue car in Massachusetts last month, then drove it back to Manhattan where he lives, authorities said. Investigators seized the vehicle from a parking garage on South William Street on Dec. 31 after acting on a tip. They then left a note at the garage with the name and phone number of a detective for Wilson to call to retrieve it, police said. Wilson contacted the detective and was told his vehicle was seized as part of a police investigation. On Monday, he agreed to meet with police thinking he would get it back, but when he walked into the 10th Precinct, he was arrested, the NYPD said. WIlson had on him $24,000 in cash, a fake California driver's license and an Actor's Union debit card for a Jeremiah I. Beckingham, the complaint said. Wilson told officers he used the Beckingham alias for "various larceny and identity theft schemes," according to a criminal complaint. A day later, investigators found more than 200 forged checks, two forged foreign passports, a fake New York State insurance card and other fraudulent government documents in Beckingham's name in Wilson's Financial District apartment, the complaint said. 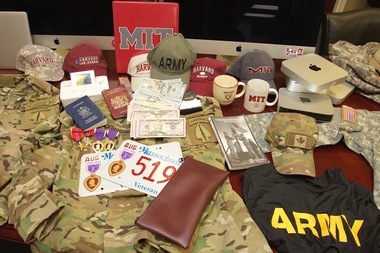 They also found military uniforms, Harvard and MIT hats, coffee mugs, computers, cash and passports, police said. Wilson told police he created the forged checks using a Boston-based business' account number to deposit and then withdraw $40,000, which helped pay his rent at 10 Hanover Square, the complaint said. A judge set his bail at $1 million, authorities said. His next hearing is scheduled for Jan. 8.